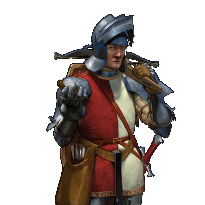 Sentries are militia soldiers drafted from the peasantry in times of war. Though they posses only cheap equipment, they can be deadly at close range and can hold their ground in melee. When not in the field fighting beside their troops they are used to garrison the towers and man the walls.